A collaboration between artists Sebastian Shmieg and Silvio Lorusso, this project examines and documents 56 images of broken Amazon Kindle display screens that result in quite astonishing pieces of collage art. In an era of highly advanced computing technology, collage has reached new heights in contemporary arts culture and has redefined itself as a medium. Its’ history is rich and dates back multiple centuries but made a strong impact beginning with early modernist periods with movements such as Dadaist and Surrealists working with found objects and photography to create new works of art. Currently, collage has found itself a new home with a generation of bloggers and creative enthusiasts glued to their screens producing content of their own. With the proliferation of digital media as well as the decline of use in print media, collage has gained a prominent role in both analog and digital worlds. 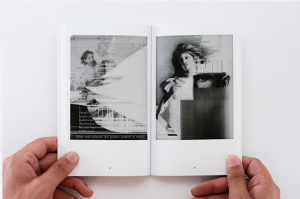 At once, appealing to those nostalgic to the physicality of books and magazines as well as making widely available to those more inclined to scour the internet’s images for use in digital collage. This project in particular blends both philosophies in an unexpected manner in which a machine built to digitally alter a user’s reading experience has now become a subject of its’ own disassociation. In a blatant irony, the conceptual aspect of the project as a documentation of a piece of work; in this case a self-published book with images fitted from broken images from a Kindle, originally created to digitize the very dematerialized thing- paper and ink has made it a unique summary of digital tools coming full circle. As a massive push towards a digitized culture continues, the materiality of the Kindle and other technological devices come under question. 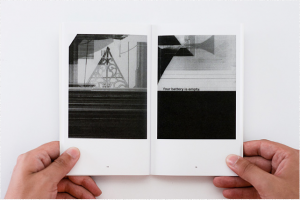 How do their electrical bodies change them from their paper counterparts in the context of fine art? Does their almost disposable nature lend themselves to the same fate, subjects to an artists collage? 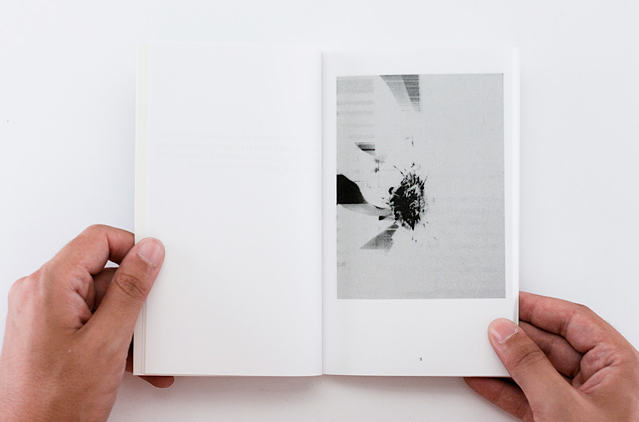 What new methods and ‘accidents’ will occur with the continuation of new media technologies within the realms of art? 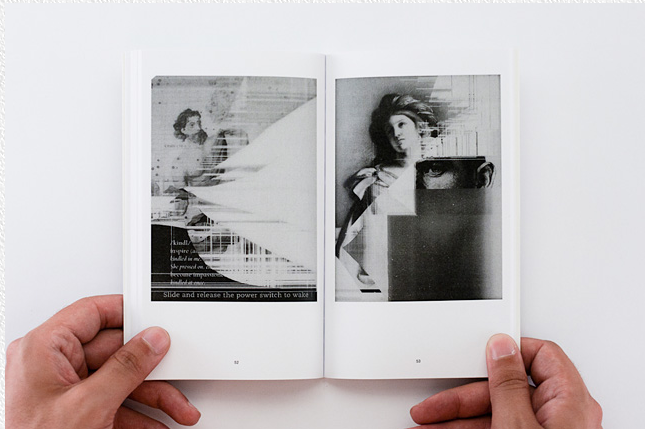 The images, created without any conscious technique aside from mere accidents bend boundaries in terms of their association with collage. 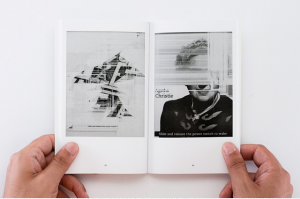 The E Ink that filters its way through the cracks of the screen are in a physical sense, take on the likeness of actual ink yet the manner in which the images are composed are of actual images stored internally within the software of the Kindle. Often the display screens are revealed in their nakedness, their internal hardware shown with black E Ink splattered across horizontal and vertical paths. Varying hues only continue where a display errors have occurred and allow for completely unique results. 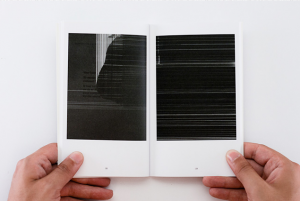 All of the works lend themselves to a similar aesthetic with one another. 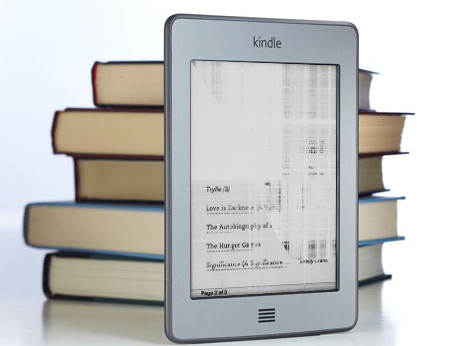 Piecing together malfunctions in both hardware and software running the Kindle, beautifully rendered pieces come alive when streaks of black E ink disguise the faces of authors like Agatha Kristie and modify their appearances with morbid precision. Sometimes erasing chunks of paragraphs and whole portions of the display leave only a blank screen with small bits of black data creating abstract pieces that can only be interpreted by the viewer. As digital practices become more common among developing nations all over the world, what discoveries in aesthetic experience will be made? 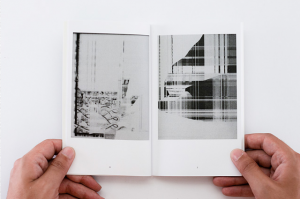 Will broken screens account for a new kind of practice? Collage is an art of reanimation. A simple matter of inclusion and exclusion of certain pieces of paper create an aesthetically binding piece is at the core of a collage artists’ technique. In this case, E Ink and the result of accidental malfunctions result in the layering of covers, sentences and layouts of digitally bound books. How digital technologies evolve and open new pathways of expression will continually be open for interpretation but this time, there seems to be an example that holds equal parts humor and irony.